In the summer one needs to consume foods that cool the body while also helping avoid dehydration and dryness of the skin. Dehydration is a common complaint and when not looked into can lead to problems like fluctuations in blood pressure, imbalance of water and electrolytes. So we need to choose foods that will keep us hydrated and not cause any health problem. To cool ourselves the foods which come to mind are cold drinks, ice creams, or foods from the refrigerator. But these can aggravate respiratory conditions. Instead have buttermilk, tender coconut water, soups, lime water, and fresh vegetable juices. Add a pinch of salt and sugar as it helps to keep up the water and electrolyte balance. Also, eat fresh fruits like watermelon, muskmelon, citrus fruits, and vegetables like cucumber and gourds. One should not fill their stomach with water or fluids alone. Fluids are essential but should be consumed preferably in between meals. Avoid deep fried foods, sweets and chocolates, and bakery items. Avoid the excess salt intake. Avoid packaged drinks as they contain preservatives, which are not safe. Drink at least 10 to 12 glasses of water a day. Keep sipping water throughout the day. Avoid fried foods, sweets, and junk foods. Eat at least 2 to 3 fruits a day. Prefer fruits rather than juice. Avoid aerated drinks. Eat plenty of vegetables both fresh and cooked. 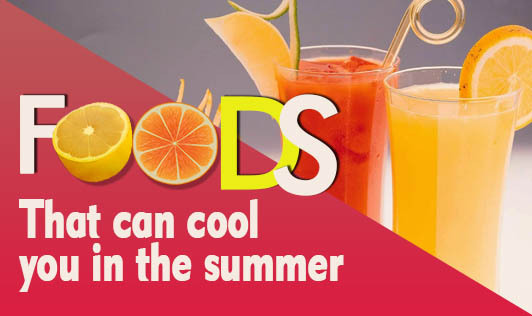 Follow these tips and remain cool and healthy this summer!